The goal I had been so waiting to transpire has indeed taken place. On January 3, 2013 I set a goal of achieving 10,000 visits by December 31, 2013. As of 6:45 a.m. (CST) today my goal was trashed. 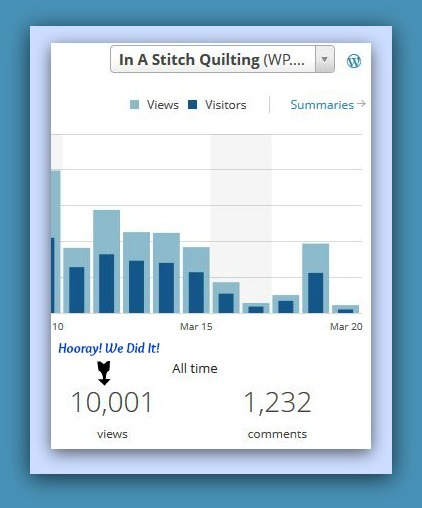 Thanks to the wonderful people that visit my blog we have achieved this milestone! We Did It, We Did It, We Did It!!! < Sandy Quilt # 4 is Finished! Congratulations on breaking 10,000 you need to have a party. Vamos combinar de ser felizes para o resto de nossas vidas???? Parabéns pelo seu sucesso e trabalho bem feito.Bençãos. Many thanks! What a wonderful idea! Yay!!! We did it… how are we gonna celebrate?/!! Well hello there! How wonderful of you to visit! Thanks a million for the congratulations! Thanks for stopping by.